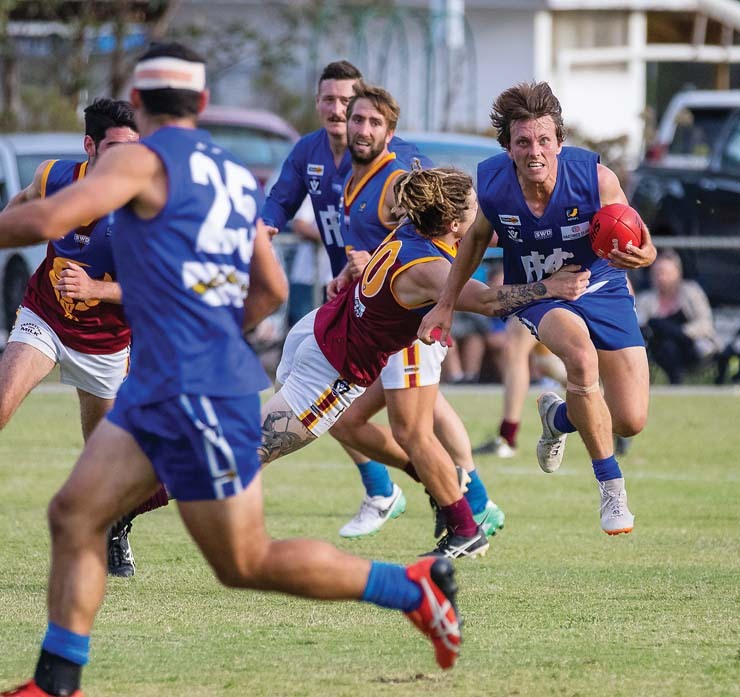 A ONE point thriller between Somerville and Seaford was the highlight of the weekend as MPNFL football returned for round one. After dropping down from the first division last year, Seaford were looking to make amends and stamp their influence on the league early. They kicked seven goals in the first term and held a comfortable 31 point lead at the main break. Somerville chipped the Tigers back a bit before the final term, with the margin standing at 13 at three-quarter time. Despite a nine goals to four second half, Seaford were able to hold on by the skin of their teeth to claim victory in their opening game for the year. When the final siren sounded the Tigers were ahead by a whisker. They defeated Somerville 14.11 (95) to 14.12 (96). At Ballam Park, Red Hill travelled to take on Karingal. The Hillmen were defeated in last year’s grand final, and with a young and exciting list will be looking to do one better in 2019. Karingal showed that they were not to be taken lightly, and fans were treated to Marc Holt. The new signee backed up a big debut last week by scoring a bag of seven to help the Bulls to victory. The full forward was unstoppable, proving himself to be a star after crossing into the MPNFL from Cranbourne. Karingal led at every break, and although Red Hill fought hard they couldn’t quite get their noses ahead. The Bulls took the game by the horns and won 11.7 (73) to 9.10 (64). Langwarrin enjoyed a good day at home against Chelsea, as they ran out 27 point winners. The contest was tight all day, with Chelsea going into the first break in front. Langwarrin got back ahead, but the margin stood at less than two goals going into the last term. Langwarrin proved to have the legs after a big pre season, as they kicked away and scored a 13.9 (87) to 8.12 (60) win. Crib Point were looking to bounce back from a disappointing 2018 with a new coach at the helm. They took on Rye at home to start off their year. Rye got off to a hot start but kicked 1.9 in the first term to keep Crib Point in the game. The Magpies fought back but Rye were able to get out to a comfortable enough lead to secure victory. The Demons won 10.11 (71) to 16.17 (113). At Thomas Barclay Oval, Hastings got their season started over Tyabb. Hastings were without their star recruit Brendan Fevola, but still had little trouble seeing off the Yabbies. The Blues showed their intent by kicking five straight in the first term. The final score read Hasting 12.8 (80) to Tyabb 5.9 (39). Michael Theodoridis showed he will once again be a force to be reckoned with up forward in 2019, as he kicked six major to help his Devon Meadows side to a big win over Pearcedale. Pearcedale didn’t get close all day, and eventually succumbed to a 45 point loss 10.10 (70) to 18.7 (115).